For now known as Wolferl, little Wolfgang Amadeus Mozart lives only for music—and he already knows how to appreciate it in all its forms, even the most unexpected. The young virtuoso is looking for—and finding!—inspiration wherever it hides, even in the cries of Nannerl, his sister, or the poop of his dog. He takes lessons from the birds, crickets and frogs, intertwining every note into his great masterpieces. A charming tale, riddled with good humor and poetry. 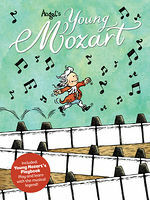 This book resonates with music lovers of all ages! 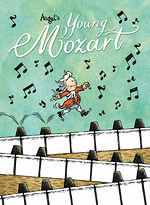 "Young Mozart strikes a whimsical, almost Peanuts-like atmosphere, finding inspiration in everything from a baby’s cries to passing bugs to the dog’s, well, poop." "A charming book about artistic passion fueled by the boundless energy of youth." "Wolferi's inspired musical antics spark the reader's imagination. It's a wonderful mix of historically accurate information and humor that brings out the playful child inside of all of us. You'll have so much fun during the journey, you won't realize how much you’ve learned!"